The following text constitutes letter 37 in the various editions of “The Mahatma Letters”. The reader will find the facsimile of its original manuscript in PDF at the end of the transcription. Addressed to Mr. Alfred P. Sinnett, the letter was received in January 1882. It was written down by the advanced chela Djual Khul , also known as “The Disinherited”. The document was written in blue ink soon after the Master came back to individual consciousness, having closed a three months’ retreat in contemplation. 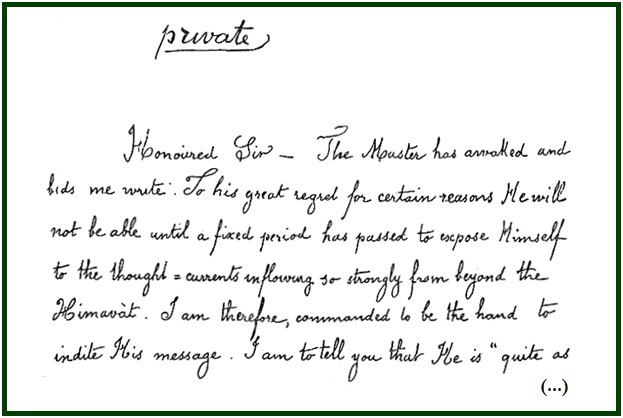 The letter refers to Mr. D. M. Bennett, a free-thinker from the United States who edited the journal “The Truth Seeker”. Letter XLV, in the TUP and Adyar TPH editions of “The Mahatma Letters”; Letter 47, in Chronological Edition. These are the Master’s words, as with His help I am enabled to frame them in your language, honoured Sir. I am personally permitted, at the same time to thank you very warmly for the genuine sympathy which you felt for me at the time when a slight accident due to my forgetfulness laid me on my bed of sickness. Though you may have read in the modern works on mesmerism how, that which we call “Will-Essence” and you “fluid” – is transmitted from the operator to his objective point, you perhaps scarcely realize how everyone is practically, albeit unconsciously, demonstrating this law every day and every moment. Nor, can you quite realize how the training for adeptship increases both one’s capacity to emit and to feel this form of force. I assure you that I, though but a humble chela as yet, felt your good wishes flowing to me as the convalescent in the cold mountains feels from the gentle breeze that blows upon him from the plains below. I am also to tell you that in a certain Mr. Bennett of America who will shortly arrive at Bombay, you may recognise one, who, in spite of his national provincialism, that you so detest, and his too infidelistic bias, is one of our agents (unknown to himself) to carry out the scheme for the enfranchisement of Western thoughts from superstitious creeds. If you can see your way towards giving him a correct idea of the actual present and potential future state of Asiatic but more particularly of Indian thought, it will be gratifying to my Master. He desires me to let you know, at the same time, that you should not feel such an exaggerated delicacy about taking out the work left undone from Mr. Hume’s hands. That gentleman chooses to do but what suits his personal fancy without any regard whatever to the feelings of other people. His present work also – a pyramid of intellectual energy misspent – his objections and reasons, are all calculated but to exonerate himself only. Master regrets to find in him the same spirit of utter, unconscious selfishness with no view to the good of the Cause he represents. If he seems interested in it at all, it is because he is opposed and finds himself roused to combativeness. Thus the answer to Mr. Terry’s letter sent to him from Bombay ought to have been published in the January number. Will you kindly to see to it – Master asks? Master thinks you can do it as well as Mr. Hume if you but tried, as the metaphysical faculty in you, is only dormant but would fully develop were you but to awake it to its full action by constant use. As to our reverenced M: he desires me to assure you that the secret of Mr. Hume’s professed love for Humanity lies in, and is based upon, the chance presence in that word of the first syllable; as for “mankind” – he has no sympathy for it. P.S. Should you desire to write to Him though unable to answer Himself Master will receive your letters with pleasure; you can do so through D. K. Mavalankar.